Today we are reviewing this new smartwatch called the MyKronoz ZeWatch BlueTooth Smartwatch, sent to us by MobileZap. There has been a lot of talk about smart-watches over the past year or so as Apple and Samsung are reportedly working on their own devices. However some manufacturers have shot ahead and already produced their own smart-watches to complement your busy digital lifestyle. I haven’t worn a watch for 10+ years so wearing this ZeWatch was a ‘new’ experience for me. The watch is designed in Switzerland so you can be assured of a sleek and quality feel. 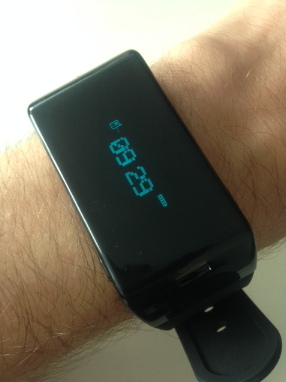 The devices allows your to sync to your mobile and tablets to the watch via bluetooth. Any incoming calls can be answered through the watch (by pressing the side buttons on the watch) and you can speak into your wrist instead of getting your phone out of your pocket. You can even play your phones music through the speaker on the watch, saving your phones battery for more important tasks. The watch even has an alert feature – if your phone was to go 10 metres away from the watch while synced, the watch will start vibrating to make sure the owner hasn’t left their phone behind or from being stolen. The device is powered by a USB charger and normal battery life is around 3 days standby with 2-3 hours talk time. Whilst a simple device, those looking for a bluetooth solution without plugs in your ear may like to consider this time-keeping device. You can see this product here on the MobileZap website.